Say Hello to "GOOB," our New O's Blogger! The Ravens aren’t the only ones making moves today. Here at the Nest, we’re committed to stepping up our game this Spring and Summer with respect to covering those other birds in town, the Orioles. I’ve tried over the past two summers to regularly post on the orange-and-black happenings, but it hasn’t happened to the degree that I would have liked. That’s why, for the 2010 baseball season, we are proud to announce that we have enlisted some help. Say hello to “Goob,” your new B’More Birds’ Nest Orioles blogger! Regular readers of this site are very familiar with Goob. As a good friend of mine, he has been a commenter since Day 1 (way back in the bmorebirdsnest.blogspot.com days), and has been featured prominently in several posts. Goob lives in North Carolina, but thanks to the magic of DirecTV, can now watch every O’s game on MASN just like us Baltimorons. Look for O’s blogs from Goob starting sometime later this month. 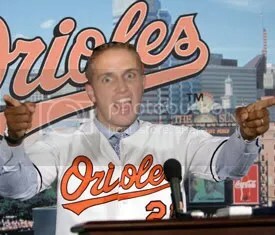 This entry was posted on February 17, 2010 at 1:24 pm and is filed under News, Orioles. You can follow any responses to this entry through the RSS 2.0 feed. You can leave a response, or trackback from your own site.